I make several styles of baton. I use wood or fiberglass for the shaft, and wood or cork for the grip. Several woods are appropriate for the shaft, birch and hard maple are both light and thus more visible, but cherry makes a beautiful baton as well. The length is to your preference, with the default length fourteen inches from end to end. 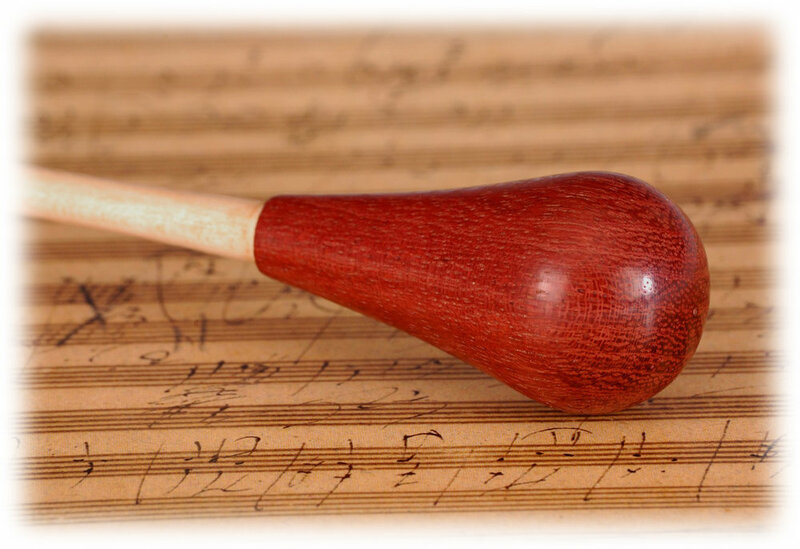 The grip is made to fit the hand of the conductor, and is either a cork sphere, which makes a very light baton with the balance forward, or a wood teardrop with the balance point at the junction of shaft and grip. Unless you wish different, the turned grip is two inches long and one inch at the widest point. I make both working batons, carefully sized and balanced for long rehearsals, and presentation batons - perfectly serviceable - with an engraved presentation/storage case from fine wood.